Can You Outrun Warehouse & Factory Safety Bogeymen? AisleCop: Pedestrian or Forklift Priority? A Guide to Conveyor Rollers "Set Low"
So You've Decided To Automate Your Facility. What Next? How Can You Go Forklift-Free? WERC's Warehousing Certification Process: What's in it for You? Distribution Center Metrics: What's Your Focus? What are Others Doing? What Pressures are Distribution Center Managers Facing in 2017? In Tight Labor Markets, How Can Warehouses Thrive? What Causes a Pallet Rack Collapse? How Can You Prevent it? What’s the Right Warehouse Rack System for Your Operation? What are the Latest Industrial Automation & Robotics Trends? What’s Next for Manufacturing Technology? Which Carton Flow Type Fits Your Application? How Many Order Picking Errors Go Unreported? Air Balancers and Hoists: What's the Difference? Order Picking Error Rates: What's Acceptable? Manufacturing Automation: What Is It? Where Is It Going? Are We Automating Jobs Away? What's the Best Pallet Rack for Your Application? Warehouse Safety Sensor Systems: Which Fits Your Needs? Video: 24-Volt Roller Conveyors "Simplify Everything"
Folding Gates - Make that a Double? A Mirror's a Mirror and a Sensor's a Sensor, Right? Post-Modex Report: What’s the Buzz in Manufacturing Technology? Industrial Security: Does Surveillance Increase Productivity? When is a Mezzanine not a Mezzanine? Can Warehouse Safety be Automated? What Causes Pallet Rack Collapses? Don't Climb that Pallet Rack! What's it Cost to Run a Warehouse in Your City? 11% of Forklifts are Involved in Accidents Annually. What Can You Do? Manufacturing & Distribution Professionals Pressured to "Deliver More Value"
How Much Difference do Fully-Enclosed Pallet Rack Frames Make? Did Wood Pallets Cause the Tylenol Recall? How Much Money does Shipping Rivet Shelves Without Decks Save? What's the Most Useless Space in your Warehouse? Gravity Conveyor: How Many Skatewheels do You Need? Can Your Floor Bear the Weight of a New Mezzanine? Cisco-Eagle to present at North Texas WERCouncil End of Year "Celebration and Education"
Palletizer Perspectives: Is Palletizing Suitable for My Operation? The Forest for the Trees - Does Your Operation Need a Review? Mobile weighing: getting it right means being able to weigh and count "on the spot"
"If you don't maintain physical security in the real world, any and all safeguards you erect in the virtual world may be meaningless." What Type of Industrial Shelving Would Work Best for You? Cost of delivery - look out! Cross Docking: What are the facility layout considerations? Download: "10 Ways Material Handling Increases Security"
Am I Wasting Time: is Cross-Docking a Viable Consideration for my Company? Cross Docking: Is it Right For Me? Is supply chain sustainability more than a marketing ploy? Benchmarking Warehouse Performance...What do You Measure, and How? Is the midwest the best location for your distribution center? WMS on demand - is it for you? What is Dynamic Zone Allocation, and why do You Need it? Are You Loading Pallet Rack Beams Near to Rated Capacity? In many operations, things like conveyors or pipe runs or other machinery interrupt the flow of a work floor, and the obvious way to get around it is to erect a crossover. 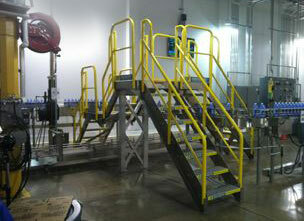 This is commonly done in larger scale conveyor systems with longer lines, but we also do them for other areas where going around the obstacle could take significant time, or where access is limited by other factors. The question is, what type of crossover best fits your needs? In the past, many if not all crossovers were custom fabricated. A lot of people built their own, and some of those home-made jobs were not exactly engineered for safety. They were also scrap metal if something changed in the operation and their current configuration was unsuitable. That’s not the case these days – there are relatively economical pre-built crossovers that can fit just about any need, and that meet local building code and/or OSHA safety guidelines. Your access choices now are more diverse than ever. What we’ve run into lately is the option for a permanent crossover, built for the task, and mostly designed to stay in one spot compared to the modular crossover, a flexible crossover system built from common components, but that can be made to fit virtually any space or application. Equipment Cost: Little doubt of it, the tubular type crossover is less expensive. 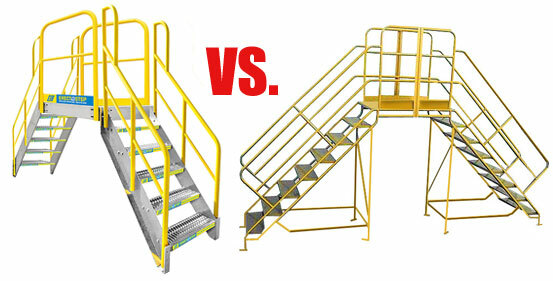 In a comparison of a simple, two stair system of comparable size, a tubular crossover is clearly less expensive. This model is currently $1,700 or more. If you chose a modular system, the cost is much higher – nearly four times the cost. Shipping: Modular crossovers ship disassembled, at a lower freight class and cost. Its cost is reduced relative to the fixed crossover as it costs significantly less to ship, as the modular units are able to ship knocked down and palletized, but that doesn’t account for enough of the cost difference to make it directly competitive. Since they can be palletized, the chances for product damage in transit is reduced. Versatility/Transportability: Because the modular systems are built from standard components, akin to tinker toys, they excel at this. They can be disassembled, moved, and reassembled without special tools or expertise. They can be completely re-used, so that their parts could be utilized in building an entirely different structure for re-tasked use. They can be taken down for maintenance or plant reconfiguration and re-installed with relative ease, so their ongoing cost of ownership may be less than that of a welded or tubular crossover. A welded (home made) crossover might have to be cut apart to be moved. A bolted one might need to be re-assembled and have issues with that. Neither of those types can be re-tasked or re-configured easily. Availability: In particular, if nothing that is standard will satisfy your need, modular crossovers are much easier to order and can ship quickly — 3 days, as opposed for 3 weeks or more for standard crossovers. Since modular crossovers are built from standard components, those can essentially be pulled from inventory and shipped. Nothing has to be built or put into production. For custom sized tubular or welded crossovers, the wait can be weeks. Scott Stone Cisco-Eagle's Director of Marketing. He has over 25 years of experience in the industry.